Right now I’m at Stephanie’s bedside, watching her navigate the ins and outs of popsicle consumption while under the influence of numerous intravenous drugs. We’re nestled in her hospital room after a long, yet incredible day. Today has God’s fingerprints all over it. I left off the last post in a second waiting room while Stephanie was getting a PET scan, which is the head-to-toe scan to detect any further traces of cancer post-surgery. 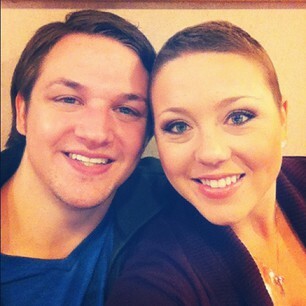 God has once again answered our prayers: the PET scan showed no signs of cancer anywhere in her body. This is a HUGE praise, and a wonderful way to close the day. God has answered prayer after prayer in this process, and each and every one of your prayers had an incredible part in this. God wasn’t done performing His miracles just yet. However, the larger, taller boxer has the upper hand. Here’s why. The taller boxer has greater reach. The taller boxer has easier shots at the head, while the smaller boxer has a terrible time trying to get in that knockout punch. The smaller boxer’s “advantages” become weaknesses because the energy will fade. The speed will diminish, the strength will subside, and fatigue will set in. The larger boxer will never run out of reach, never run out of height, never run out of what is permanently his. This is the moment when the larger boxer can deliver the knockout punch. Often times during this journey, I have felt like the enemy kept getting the upper hand. I’d get discouraged and I’d get downright pissed. “He’s too fast, too strong… he’s getting inside and doin’ work on us.” Then when I’m at the lowest points, I look in our corner. Where does our help come from? It comes from the Lord. He strengthens us, bolsters us up, makes us larger than we are so that together in faith, we can triumph and be the last ones standing. By now, Stephanie is fast asleep having successfully triumphed over the popsicle as she has triumphed over and over again today. I can’t begin to explain how proud I am of her, for her unwavering faith and dependence on God. I’m proud of how she’s used this circumstance to glorify Him. Like she mentioned in an earlier post, we aren’t really afraid. We know who wins this fight. Again, thank you for your prayers and support and for being in our corner with us. Today was full of blessings and miracles from the moment we woke up to now. Oh, and for those who kept up with the blog for Stephanie’s first surgery, you’ll remember that she received an angel pin on her hospital gown from her surgeon. Well, she got another one. Angels were definitely on our side today. I was about 30 minutes removed from publishing the last post when MJ, Stephanie’s surgeon, showed up in the waiting room to talk to me. It took me a second to process it because she had shown up so soon. She told me that Stephanie was all done with the surgery. MJ was able to remove a large (and I mean large. Like, massive) tumor from Stephanie. 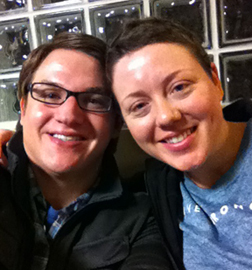 Here’s the praise for answered prayer: this beast of a tumor was NOT attached to Stephanie’s colon! God has heard and answered our prayers and it bears repeating, God is GOOD! 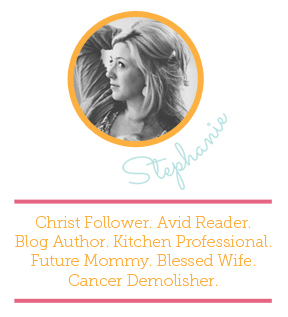 The tumor, however, was attached to one of Stephanie’s ovaries, so that one had to go. A small price to pay in comparison to the battle we find ourselves in. As an artist, I’m about as far away from a medical mind as one can be. However, through this journey, if I’ve learned anything about this type of cancer, it’s this: this type of cancer plays dirty. It has no moral code, it has no manners, it doesn’t care about your circumstance or how you feel. It is evil. It grows and it grows relentlessly. But this is no match for the greatness of our God. No matter the circumstance, no matter how backed up on the wall you are, if you have breath in your lungs you keep fighting, you keep swinging and you never give up. As God’s children, we’re often oblivious to how He’s working in us or if He’s even working in us at all. God is relentless in the pursuit of His children. He knew each and every one of us before we even knew ourselves. We, as small and minuscule as we are in comparison to the universe, were on His mind from the very start. He knew that Stephanie and I would be here on this day, and He knew that by having us here, He would be glorified. God is working and He is making miracles happen. That’s what He does. He’s in the miracle business. When someone needs a miracle, there’s no one else to turn to. He’s the Great Physician, Healer, everything. As for Stephanie, she is off to get a PET scan (NOT a CT scan) to make sure there are no other visible traces of cancer, and so I find myself in a different waiting room. I got to see her in between surgery and the scan, and she was still smiling, full of spirit (and morphine), yet she was glowing as if Jesus physically performed the surgery Himself. God’s at work in this girl and for that I’m forever thankful to Him, and also to all of you for your prayers, thoughts, and words of support and encouragement. Even the smallest Facebook “like” doesn’t go unnoticed. We value each and every one of you. Once we got in the car on our way to the hospital, we listened to the “Jesus Is _____. Music Project” from the City Church in Seattle. 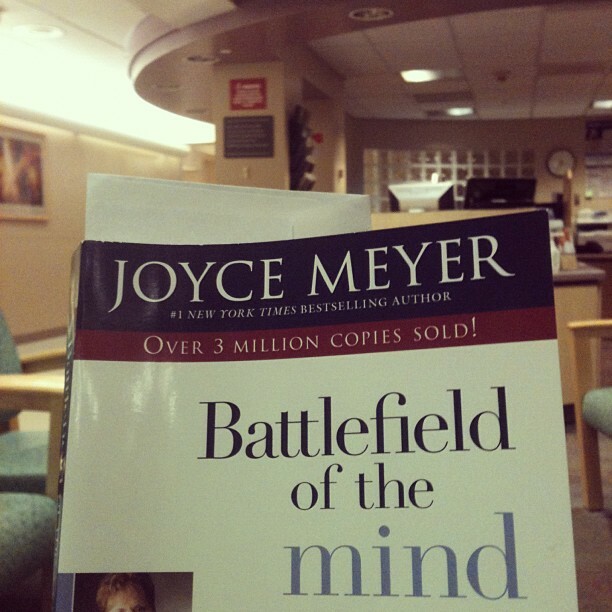 That trip to the hospital, just focusing on who Jesus is, put us in the best of moods no matter our circumstance. While I was back with Stephanie before they wheeled her away for the second time, we prayed. We prayed for healing. We prayed for strength. We prayed for endurance and perseverance for what we know is to come. We also prayed that God be glorified through our experience, not only to ourselves, but to other people. God is good. He uses situations and allows things to happen so that He may ultimately be glorified. While we have faith in Stephanie’s surgical team, nurses, and doctors, we know that God is orchestrating a beautiful story and He is using them to help craft it. Our faith is in God. We don’t put all our eggs in the basket of this world and just hope that nothing comes along to break them. Our faith is in a Higher Power. God does not operate according to the laws of this world. We continue to believe in the supernatural healing power of God. When Jesus walked the earth, He never denied anyone healing. He was never too busy or didn’t care enough about people to not help them. He never told someone, “I just really can’t help you. You’re beyond help.” No! That’s not our God. Our God is a God of love, mercy and healing. Our God can heal and there be no medical explanation for the healing. These are called miracles. And we believe in miracles. So, here I sit. I’m in the waiting room, blogging away per my bride’s request. She has been in surgery for almost an hour at this point, and the surgeon said that the surgery should take about two hours. According to my calculations, that puts us at roughly the halfway point. Our faith is strong and God hears our prayers just as much as He’s hearing yours. We thank each and every one of you for petitioning the Father on our behalf. Though it may be silent as you pray, God listens. He hears our calls, He knows our worries and our concerns, and He wants each and every one of us to be healed. Leaning into Him is the best place to be, and that’s where we are right now. I will post at least one more update today if not more, depending on how things go. Thank you for lifting up my wife in prayer. We appreciate and love each and every one of you. God bless, and keep the faith. Let me begin by saying that I am completely and utterly overwhelmed at the amount of support I have on my team. Thank you to those who have sent encouraging messages, comments, phone calls, and texts. Thank you to my loyal readers who have followed me from my initial diagnosis and continue to stand by me through this next journey by uplifting me in prayer. Also, a big thanks to my new followers who found me through an internet search or word of mouth. I have a whole army of prayer warriors, and I am humbled that you each care so deeply about my victory. In fact, from yesterday’s posts until now, I have had well over 2,000 views on my blog. Thank you for sharing my story and spreading the hope! My sweet husband and I went to bed last night with a huge prayer request on our hearts. We desperately wanted to hear back from this doctor at MD Anderson, and fervently asked God that we would hear from him personally in the morning. Bright and early, my phone rang. It was a Houston number. In fact, it was the physician. I immediately answered and was able to speak directly to the doctor I so desperately needed. Long story short, he completely agreed that I need immediate surgery to remove the mass. Chemotherapy before surgery just won’t cut it. We’ve got to get this beast out of me as soon as possible. In addition, he encouraged me to remain positive and believe that with this surgery, there will be no more signs of cancer in my body, and that I will beat this. I told him, “Doc, I’ve got this…I’m very confident that I’ll beat cancer!” Not only did he confirm our beliefs for immediate action, he doesn’t find it necessary for us to travel to Houston just yet. He believes that everything my doctors are doing here, is what he himself would do there. Praise God! Now we don’t have to worry about traveling and all of the insurance hoopla! With all that being said, it’s true…God answers prayer. Not that we have ever doubted that for a second, however, while we’ve known that for most of our lives, we can’t recall such a big prayer being answered so quickly. Right when I’m not sure, God shows up. He’s right here, and while I can’t see Him, I know His hand is all over this situation. Now that that prayer has been answered, we would like to share another one. After further speaking with my Gynecologic Oncologist, who happens to be my previous surgeon and will be this time as well, she informed me of the exact location of my tumor. It is hanging out right next to my sigmoid colon. In easier terms, it’s partying right around my lower colon/bowels. Because of its location, she won’t be able to know for a fact if it’s actually connected to that organ or not until she opens me up. There are three possibilities we are facing. One: She begins surgery and sees that the mass is not connected to my colon, and can therefore, easily remove the tumor without anything else. Two: My tumor appears to be slightly attached or embedded in my colon, in which case she would need to remove part of my colon, and perform a temporary colostomy. Temporary meaning, I would receive a colostomy until my chemotherapy was finished and as long as there is not another recurrence, she will later repair my colon. Three: The monster is too deeply attached or embedded in the colon, and she will need to remove the organ and perform a permanent colostomy. For those who are unaware of the medical procedure I’m referring to, feel free to look it up here. To be frank, while I know that a colostomy is not the end of the world, and will allow me to live a fairly normal life, I’d really prefer not to have to go down this path. Please pray and believe with us that the tumor is not attached to my colon and that my surgeon will easily be able to remove it without having to remove the organ as well. We know that God answers prayer, and are standing firm in our faith. As I have mentioned, surgery is a priority. It needs to happen immediately, and now that all of my doctors are on the same page, we can proceed. Buckle up friends…My procedure has been scheduled for tomorrow morning. Yes…tomorrow, Friday the 29th, as in less than fifteen hours from now. We are more than okay with this, and in fact, are welcoming it. We understand that in order to ensure the best possible outcome, this mass needs to be removed. I’m ready to have this thing out of me. While we know and appreciate that many of you will want to stop by beforehand to pray with us, we politely ask that you pray from where you’re at in order to ensure that the waiting room does not overflow. Plus, if I didn’t have to be up and around before 6am, I wouldn’t. Therefore, you shouldn’t have to! Surgery will begin around 7:30am. For those out-of-state, we are on mountain time. Matt will be taking the reins and doing guest posts to update everyone on my progress. The surgery should take two hours, and I will be in recovery for a couple of hours as well. By noon, I should be in my room highly medicated for the expected pain that I will be experiencing. Is it wrong to say that I’m looking forward to that part? No, not the pain…the medicine! By Saturday I am sure I will be comfortably settled in and more than willing to have visitors. For those wanting to visit, please text myself or Matt. To recap: Tomorrow morning I’m getting cut open. Pray that the tumor is not attached to my colon, or any other organs for that matter. Pray for wisdom and guidance for my surgical team. Pray for a smooth surgery and a speedy recovery. Pray for my dear husband, that he will feel the supernatural hand of God and that he will experience peace, calm, and assurance. And please pray for me, that God will give me strength, peace, and confidence. Neither of us are very nervous now, but it might be a different story in the morning. For those who might be anxious about this procedure and the trial we face… know that we are confident in a complete healing. We rely on our Savior to direct our steps. He has gone before us and has prepared the way. I’ve beat cancer once, and I’ll beat it again. Last Tuesday, November 20th, I received a regular three-month follow-up scan. Typically I would have received a PET (full body) scan, however, our insurance is not cancer-patient friendly. Apparently, because my last PET scan in August came back clear of cancer, they deemed it unnecessary to cover any further PET scans unless a CT (localized) scan came back showing anything. Ridiculous, I know. Don’t get me started…frankly that’s beside the point. I got a call from my Gynecologic Oncologist just two days ago, on the 26th. She immediately asked where I was, which in my heart, I knew was a bad sign. I was right. She informed me that my cancer has recurred. Dammit. While we aren’t sure of the exact blueprints of this next treatment journey, I will give you as much information as we currently know. The mass that appeared in the CT scan is exactly the size of a softball. Yes, you read that correctly…a softball. Honestly, it’s one centimeter bigger than an adult softball. But that’s semantics. At it’s widest, it’s nearly four inches (9.8cm) in diameter. Shocking, I know. Clearly, this type of cancer is proving to be as aggressive as we were initially told. In August there were no signs of cancer, and only three months later, there is a beastly tumor the size of a softball growing inside my body. This circular mass has been located in the same general vicinity as my original golf-ball sized tumor. It is near my pelvic region, and close to my mid abdomen around my belly button. It’s closer to my left side, and I can actually feel it. About one month ago, I began experiencing pain in this exact location of my lower abdomen. Because the doctors usually push around my stomach when I get any check-ups, I thought I’d give it a go. I definitely didn’t expect to feel anything. But I did. I felt a hard mass. Because having already battled cancer often tends to making us survivors paranoid and hyper sensitive to any changes in our bodies, I tried to brush it off as nothing. Three weeks ago, I had a regular three-month follow-up with my doctor and informed her about this sudden change in my body. She explained that based on how our intestinal tract works, it most likely was just a back up of stool and that she couldn’t feel anything during her internal exam. In fact, my pap smear results were normal. However, the pain continued and progressed. Days went by and the mass remained. I chalked it up to being constipated. Maybe I was just more backed up than I thought. Now that the CT results are in, we can most definitely connect the pain and hardness to this mass that has been discovered. My constipation is also a symptom. While, we don’t know exactly where this monster is thriving, my doctors believe it’s getting it’s blood supply from my bowels. That means lower intestinal tract. Hence the constipation. This beast is sucking the life out of my lower organs. And, have I mentioned how huge it is? I’m still shocked. Where we go from here is a little up in the air right now. Surgery, radiation, and chemo are all on the table again. It’s a matter of the sequence of these treatments in determining the effectiveness. Late yesterday afternoon we met with a General Oncologist that my Gyn Oncologist recommended we see. Once we met this doctor, we immediately adored him. God has sent us another key player for our team. He is a genius when it comes to chemotherapy. He knows all the different types of drugs and their side effects. His knowledge immediately put us at ease. In addition, he treats a lot of lung cancer patients. Most lung carcinomas are similar to my Neuroendrocrine cancer. He knows his stuff. All of my doctors do, and we are so grateful for that. After explaining to us what we were dealing with, he began to talk about treatment options. Surgery first, then chemo? Chemo to shrink it and then surgery to remove it? While my current three Oncologists (Radiation Onc, Gynecologic Onc, and General Onc) are well versed, they really want the opinion of another expert. As most know, MD Anderson is the biggest and best cancer center in America. Through word of mouth and recommendations, we have learned of a special doctor in Houston who is the lead researcher for my exact type of cancer. He is continually studying how my carcinoma works and what the most effective treatments are. Therefore, we need to get to Houston to see this expert immediately. My Oncologists here agree that I need to get out there as soon as possible… Like yesterday. However, remember the hoopla with our insurance? Again, they deem it unnecessary for me to travel outside of our basic providers to receive a consultation or treatment out-of-state. Completely asinine. Essentially, they require that my doctors here call the authorization department of our insurance company and explain the urgency and necessity of this MD Anderson visit. Being fed up, I asked what it would cost to get an appointment without using our insurance and the receptionist answered, “$27,000.” Needless to say, we need insurance to agree to cover this out-of-state doctor’s visit. That’s a huge prayer request of ours right now. Long story short, we need to get this ball rolling. This cancer is fast-growing and more aggressive than I ever imagined. I’m desperate to get this monster out of me. I want it gone, and I will do whatever it takes. I’ll go to Zimbabwe to receive a shot made from monkey saliva if I need to. Whatever it takes. And not to mention, this sucker hurts. We knew cancer was mean, but this is at a whole different level. My stomach throbs, and any time I touch it, it fires back… Umm, no sir. You will not win. We are going to poke, prod, cut, poison, and demolish you. Get the hell out of me. It is imperative that I receive a PET scan in the next few days. Our team and I want to make sure it hasn’t grown anywhere else. They definitely want to check my lungs and my brain for any traces of malignancy. My team of doctors is having my case meeting today to discuss my situation and what the best course of action they believe will be. They are also going to conference call the doctor in Houston to try and see if any strings can be pulled for us to get in to see him. We could be going to Houston as early as tonight or the beginning of next week. I could also be in surgery as early as next week. And chemo might or might not start before then. Everything is dependent on my local doctors communicating with this Oncologist in Houston and getting on the same page. They understand the urgency of my situation, and are willing to do whatever it takes as well. We are all in agreement as far as getting this ball rolling as quickly and effectively as we can. We will continue to keep you updated as soon as we have a more solid plan. Initially the news rocked us. I was deeply saddened and frustrated that we would have to go through all of this again. My husband was pissed. His anger was directed at God. “How could you allow this to happen again! ?” But after a night of grieving, we woke up yesterday with a fire under our asses. My strong guardian of a husband, wrapped his arms around me and said, “It may sound weird, but I’m not scared at all.” And I feel the same. We aren’t scared because we are confident that with God on our side, we can beat this. We will beat this. I will be cancer-free again. And for more than a few weeks this time. I am determined to fight this battle and stomp on the enemy’s intentions. The enemy wants to defeat me, and there is no way we are going to let that happen. I’ve already told God that he’s going to have to drag me kicking and screaming out of this world. As incredible as Heaven sounds, I’m definitely not ready to make it my home yet. I’ve got way too many things to do on Earth. We’ve got babies to be had, memories to be made, and many more years to experience. Our faith is strong and our fire is burning. We know we are about to endure another intense and difficult battle, but there is nothing to fear. After all, “God has overcome the world.” Our victory is in Him. Cancer will not win, because I will not lose.